I wish there were some sort of typo or #FakeNews in that headline, but it’s 100% accurate. Somehow, this sequence of events happened. First, a man caught a grenade while fishing. Then, he tossed it into his bucket. Then, his tummy growled. Finally, he drove his grenade to the nearest Taco Bell. A few Chalupas and a Crunchwrap Supreme later, he realized he should probably call someone about that grenade in his pocket. 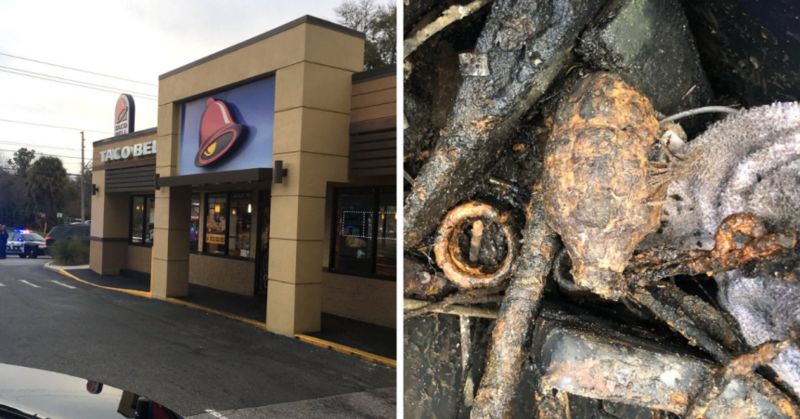 The entire Taco Bell was evacuated, which also usually happens whenever I stop at their bathroom after a Cheesy Gordita Crunch (poop joke). The man apparently caught the grenade while magnet fishing with his wife, which is a kind of fishing environmentalists practice to help remove debris from the water. It is also popular among treasure hunters who have been known to pull up everything from lost wedding rings to bicycles. Leave it to Florida Man to be the one to find a WWII grenade in a sea of rings and bicycles. The grenade was reportedly detonated for safety.